Dog crates come in all shapes, sizes, and materials. The hard part is figuring out what the best dog crate is for your beloved fur baby. The crate market is teeming with products that tempt with various features and aesthetic appeal. There’s much to consider when shopping for one. After all, prices can be steep and nothing is more disheartening than hopping from one crate to another (and watching the dollars dwindle in your bank account) only to settle on another failed purchase. From wire to fabric and plastic to wood, we’ve scoured hundreds of crates to find the ultimate products that meet a diverse range of pet owner needs. These kennels don’t just talk the talk but are safe, comfortable and durable for every type of dog. What’s Makes a Crate the King of all Crates? Do you work at an office and won’t be home all day or are you looking to crate train? Whatever your lifestyle is, choosing a crate starts with you and why you think your dog needs one. Before you begin spending on the first glorious cage you see, do some brainstorming to determine what you want to get out of the crate. Take these factors into consideration. What will you use the crate for? Will it primarily be used indoors or outdoors? Do you plan to use it for training? Or, will your dog travel frequently with you? All of these questions can help you decipher what type of crate will suit your lifestyle best. How big is your dog? There are crates available for XS, S, M, L, and XL sized dogs. One of the most pertinent rules is ensuring you choose the correct size. A dog should be able to stand, lay and turn comfortably without its ears touching the roof. If a crate is too small an uncomfortable dog is one that learns not to like the crate. If it’s too big, the extra space might tempt doggo to turn one corner into a personal toilet. Here’s how you can figure out the best size crate for your dog. How old is your dog? If you have a puppy, a wire crate with a divider is crucial. A divider allows you to purchase a large crate that a puppy can grow up with. The divider is used to allot space as the puppy grows, saving you money on buying bigger crates over time. What is your dog’s temperament? Some dogs suffer from separation anxiety or claustrophobia, which leads to destructive behavior, like chewing. They may even become masters at escaping the crate, no matter how many measures you take to keep it secure. There are heavy duty crates that accommodate dogs with special behavior needs. What is the climate like? This depends on where you live and whether you’ll use the crate indoors or outdoors. You want your doggo to be able to breathe easily while staying cool. Some crates are better ventilated than others. Are you all about style? You might have a dog that’s well-mannered in a crate. For you, a stylish piece that fits the decor of your home while giving your dog her own den space is the priority. Do you want to crate train? Beginning on this crate training journey takes time, dedication and a reliable crate. If your dog will be getting used to spending ample time in a kennel, you want her to view it as a stress-free zone. Will you travel frequently? If you will be flying with your dog, there are stringent guidelines regarding airline approved pet carriers. After you’ve thought about the main purpose for your crate use, you can learn about the different types available on the market. We’ve listed them here, so you can get a feel for the materials used, the varying structures and why one might be better suited for your dog than another. You’d be surprised at how clever dogs can be. Some are born magicians that can escape confinement with ease. Once you lock your innocent angel up and leave for the day, they have all the time on their paws to chew, bust and break their way to freedom. When a wire cage with a slide latch door won’t cut it, a heavy duty crate is the best option for an escape pooch. Dogs with a stress that display destructive behavior are good candidates for these high anxiety crates. More on the expensive side, indestructible crates feature solid metal bars that require bolts for assembly, plus a specialized locking system that can’t be slid open by a tongue or paw. Flying on an airplane can be stressful if you’re not prepared, especially if you bring your dog along. Canines under 20 lbs fly in-cabin while those over 20lbs fly in cargo. You’ll need a crate that has been approved by your airline company in order to bring them along. 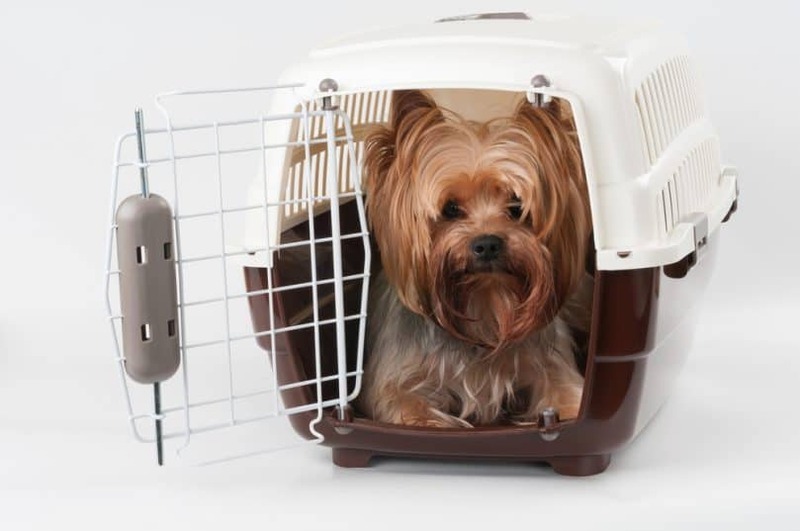 For in-cabin dogs, soft-sided travel crates are preferred because they are flexible in order to slide underneath a passenger seat (this is required). For dogs flying as cargo, it is mandatory to have a plastic crate. A list of requirements must be met for the plastic crate to be given the green light, so make sure you check with your airline beforehand. Thick plastic crates offer a different material choice if your dog prefers a more den-like atmosphere to an open one. Since the walls are solid, it’s extremely important that there are enough air holes on all four sides for healthy ventilation. That way, your 4-legged-pal can breathe without issue and stay cool. These crates are an alternative to wire crates, handy for indoors, outdoors and travel purposes. The classic wire crate sets the standard for basic and budget-friendly if your dog isn’t keen on escaping. It comes in multiple sizes that can house the tiniest teacup Chihuahua to the long-legged giant Great Dane. Convenience is key, as these crates usually don’t require any tools for assembly and can be folded up within minutes. 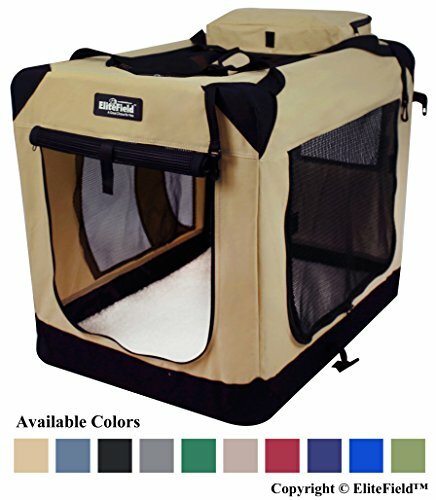 This is a good starter for crate trainers, as it offers an open and ventilated environment for your dog to get used to. It’s also recommended for puppies because of the divider feature. If you have questions about how to use a crate divider for your puppy, this video shows you exactly how it’s done. For the outdoor junkies, the soft crate is a dream come true. The fabric walls make fold-up and transport a breeze, your car interior won’t get ripped up by hard edges and they come with handy features, such as storage pockets and shoulder carrying straps. Keep in mind that fabric walls don’t hold up exceptionally well against an avid chewer. Also, if you’ve got a crate escapee on your hands- forget it. You’ll also want to ensure the sides are well-ventilated or else it can get stuffy and hot inside. Your dog is a crate lovin’ canine. Destructive behavior and potty accidents aren’t a problem. You want to give your dog a simple den they can call their own while ensuring that den matches the mahogany of your living room set. Fashion crates are all about achieving the perfect look. They come in wood or wicker and can be used as a piece of furniture, such as an end table placed strategically next to a couch. These tend to be pricey because of the meticulous craftsmanship, but they feature standard doors and locks that aren’t built to withstand escape artists. Whether it’s convenience, style or durability, crates typically come with various features. Some are handy while others we feel aren’t that big of a deal and can drive up the price of a crate unnecessarily. These are the ones we think are the most useful for pet owners. Wheels: When you need to move your large dog crate from one room to another, you’ll thank the crate gods for the wheels that attach to the bottom corners for easy portability. Make sure they are detachable and can lock into place. Clean-up tray: Made from plastic or metal, these flat pans are a lifesaver for cleaning. A good crate will enable you to slide them underneath the floor of the structure, so any mess falls into the pan instead of your home floor. Multiple doors: Specifically, a top door is divine. This allows you to easily slip food or toys inside the crate without also having to hold back a hyper pup. Carrying handle or detachable strap: This is great for soft-sided crates and plastic crates, as it allows for easy transport without too much strain on your muscles. Storage pockets: For soft-sided crates, you can use these nifty pockets to store food, poop bags, collapsible bowls and more. We’ll close up shop by giving you our No. 1 crate pick for small dogs and large dogs. Let’s get to it! If you’ve got a Houdini dog on your hands and are feeling exasperated after trying to contain your fur baby and failing with multiple crates, go for the LUCKUP Heavy Duty Dog Cage. We love the construction of this indestructible crate, from the spacious interior to the thick steel bars that are smoothed down for safety. Strong metal locks bolt into place instead of the traditional slide and latch that are possible for determined dogs to open. Heavy duty crates are expensive, but we feel that you get your money’s worth with this escape-proof crate. Sizes: 38 inches and 42 inches. There are 3 doors: 2 on the front and 1 on the top (makes feeding easy to get around a boisterous dog). 2 convenient pans slide underneath for easy cleanup. Includes 4 wheels that help make portability a breeze. 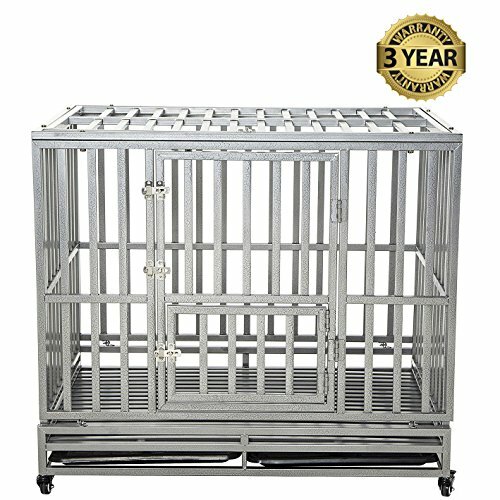 Zinger Winger DX5000 Deluxe 5000 Aluminum Dog Crate: This crate design is simple and meant for one thing- to stop escapes. Instead of metal bars, it features solid aluminum walls that make it lightweight. They are ventilated with minimal metal bars. There are no extras, such as a clean-up pan or wheels, but it’s a tough enough to hold the Houdini-est of hounds and it’s the best dog crate for chewers. 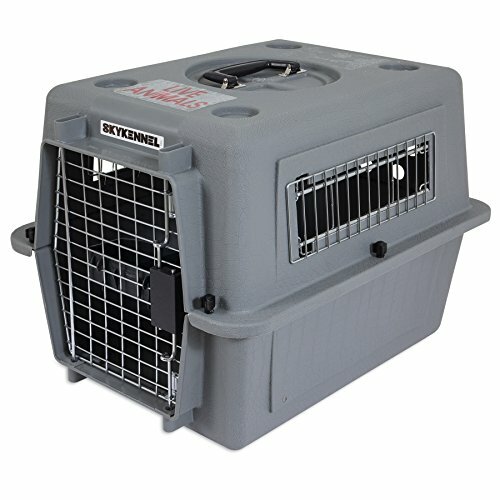 Impact Dog Crate (Collapsible), 400 Model: Another aluminum model, we loved this crate for the solid construction that makes it a worthy match against escapees. The plus to this heavy duty soldier, which is rare to find, is that it collapses in seconds for easy transport. This is also IATA compliant, so if you need a more secure option than plastic for flying, check out this model. 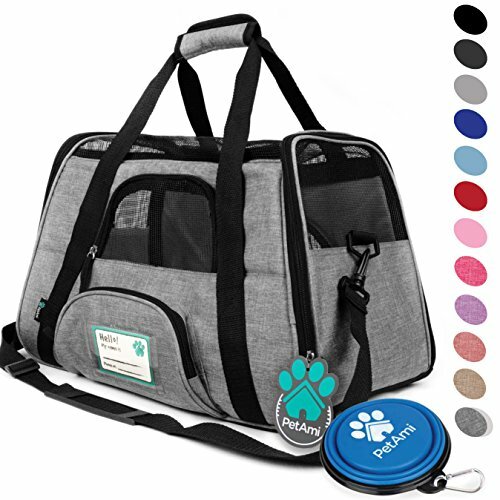 Made from high-grade polyester, PetAmi Premium Airline Approved Soft-Sided Pet Travel Carrier is our favorite airline approved crate that is built solid with none of the features left out. This company thought of convenience and comfort when it comes to dogs flying. You get a sturdy build with plenty of room for your dog to lay or stand. The sides and top are well-ventilated with mesh to ensure consistent airflow and cooling. It’s also easy to carry with a shoulder strap that detaches. We especially loved the ID tag sewn into the carrier and the included collapsible food bowl. Keep in mind that this is a soft crate made for dogs under 20 lbs flying in the cabin. If your dog is over 20 lbs and flying in cargo, a plastic crate is mandatory. You can read about our No. 1 choice for plastic crate down below. Small dogs under 20 lbs that will fly in-cabin. 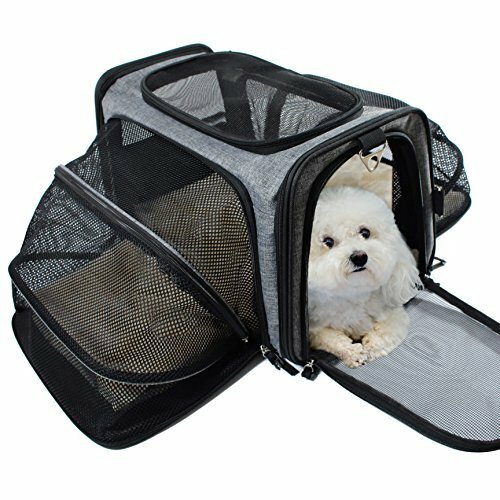 Sherpa Travel Original Deluxe Airline Approved Pet Carrier: This roomy soft-sided pet crate is one of our favorite choices for dogs flying in-cabin. The structure is well-supported by a strong spring wire frame and mesh walls that can be pushed down to fit under the plane seat. Ventilation is on all sides and it features a storage pocket and Sherpa-lined bed pad. Snoozer Wheel Around 4-In-1 Pet Travel Carrier: If carrying a crate around the airport is too much for your weary shoulder, this wheeled option allows you to roll your small dog around with ease. The sides are woven from mesh for optimal airflow and it comes with a leash clasp and pockets. Plastic crates are a great option for those who are always on the go. The Petmate Sky Kennel ticks all of the boxes when it comes to useful features and reliability. The biggest ups for us with this crate is how it’s carefully designed for flying. It meets most airline requirements, such as a design that features carrying grips along the sides instead of a handle on top. It also comes with an epic flight kit that includes Live Animal stickers, feeding bowls, holes for zip ties and absorbent padding for accidents. The construction is hardy with thick, plastic walls and metal barred openings on all 4 sides for ventilation. Keep in mind that the bolts for assembly are plastic, and if you plan to fly with this crate then you’ll need to purchase metal bolts for it to be rendered acceptable. Dogs that weigh over 20 lbs that must fly in cargo. 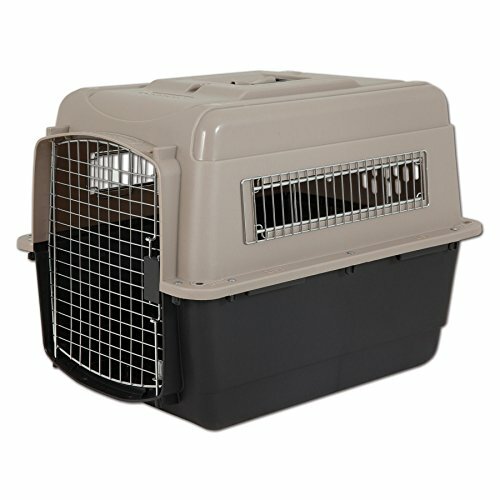 SportPet Designs Pet Kennels: Lugging around a big, bulky plastic dog crate might be a turnoff, but this one comes with roller wheels, which make maneuvering much more manageable. Better yet, if you plan to fly, then the wheels detach to meet requirements. It’s one of the few plastic crates that come with a fly kit including Live Animal stickers, water bowl and metal bolts as opposed to plastic bolts (a No No for airline approved carriers). Aspenpet Pet Porter Kennel: This crate comes in sizes for small dogs up to 15lbs all the way to big dogs weighing up to 90 lbs. It’s built tough with tall sides and a squeeze door latch. We like the quality of this one, but be extra careful to clear it for flying, as it is not ventilated on all 4 sides. 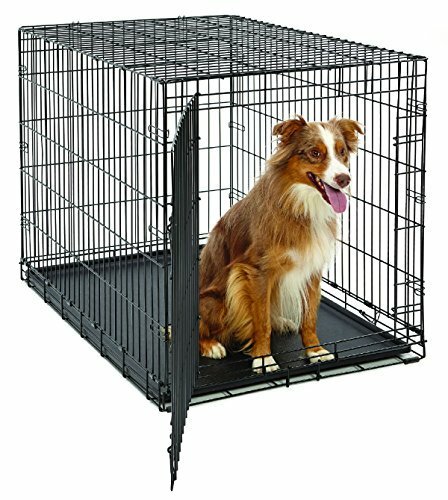 It does make a reliable crate for indoors and outdoors use if your dog likes a cozy den instead of an open wire crate. We’re going to have to settle on Midwest Homes For Pets Dog Crate for both small and large dogs. The main factor being, this crate is an overall multifunctional choice that covers all of the basics that satisfies a diverse range of doggie needs. The materials and construction quality is also highly reputable, with solid steel wire framing that gets our tails wagging. It comes in multiple sizes ranging from 18 inches to 48 inches, so it can hold small to XL dogs. It’s perfect for puppies because it comes with a divider panel. Clean up is easy with a removable pan that fits underneath the cage. No tools are required for assembly and it folds up flat in seconds for easy portability. Can choose a single door or double door with secure slide and latch locks. Small, medium, large and XL dogs that do not suffer from anxiety or like to escape. 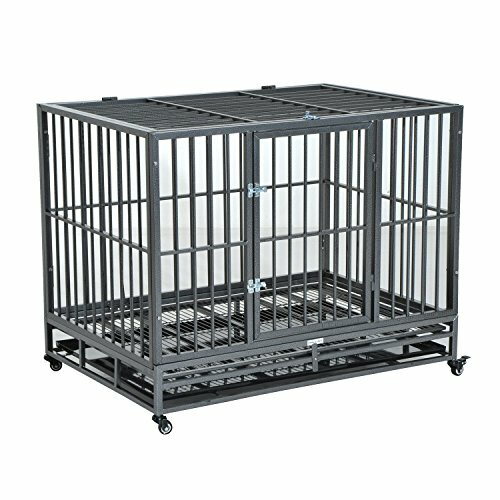 ProValu Double-Door Wire Crate: This is a top-notch wire crate with oodles of versatility. It comes in sizes fit for XS to XL dogs, so don’t worry, there’s a crate for every fur babe! If you have a puppy, this kennel includes a divider. It also folds up easily with a carrying handle located on the top, so portability is a cinch. There are no wheels included, which is a bit of a shame if you buy this for a giant dog, but still a top-quality crate. It boasts a 5 point lock system to up the heavy duty game. IRIS Wire Dog Crate with Mesh Roof: If you want something a bit more colorful than the usual black wire get up, then this crate features an out-of-the-box design without skimping on quality. Epoxy coated metal bars and smooth, plastic coated edges dissuade chewing and take the worry away regarding sharp edges. In other words, this crate is built for comfort and safety. It’s a great option for small to medium dogs. If you’re an outdoorsy type that likes to take your dog hiking and camping, the Paney Heavy Duty Rolling Dog Cage makes travel enjoyable and full of comfort for your dog. We love the high walls and spacious interior, with a large zippered front panel that allows doggo to hang out and take in the views. The strongly woven fabric is supported by strong, steel tubing with the corners reinforced by a layer of canvas to protect car interior from sharp jabs. Best of all, the assembly of this crate is what makes it a winner. It folds up or down, latching into place within seconds. This makes it a joy for travel. Trained dogs that do not chew or try to escape. 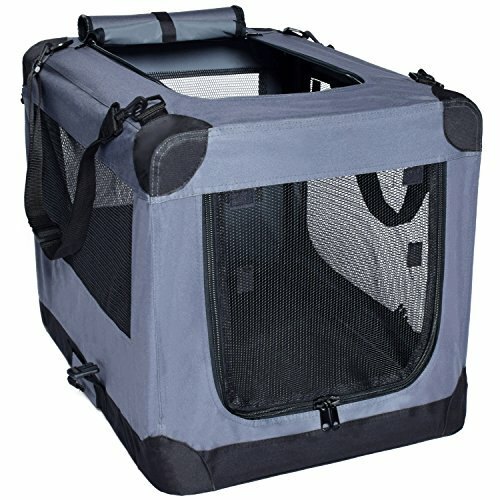 A4Pet Soft Collapsible Dog Crate: Spacious and durable, this is a well-built crate that is liquid resistant, especially where it matters most- the bottom. Rounded corners save your car from rips and tears and easy fold-up means that this is a winner for travel. We love the wide mesh side panels that can unzip to give your dog an open tent-like experience when in the outdoors. Noz2Noz Soft-Krater Indoor and Outdoor Crate for Pets: This is one of the best soft-sided collapsible dog crates for large dogs, with high walls that are well-supported by a sturdy metal frame for plenty of room. The fabric is tightly woven for toughness, and the mesh panels offer excellent ventilation and cooling for your dog. There are 3 doors located on the top, front and side for easy accessibility. Behold the beauty and elegance that is Mr. Herzher’s Large Deluxe Pet Residence. 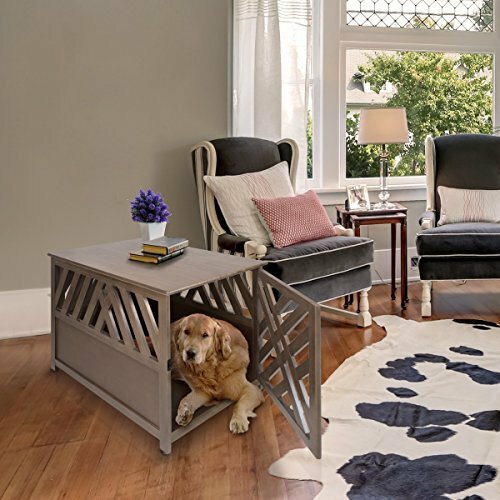 If you’re looking for a fine dog crate that doubles as a lovely end table for your living room, this wicker and wood model adds a rustic touch to your home. Fashion crates are usually pricey, and that’s why we vouch for the quality of this one. The craftsmanship is focused on aesthetics and durability, with well-ventilated walls and a door that can detach or hinge from the left or right side. Best of all, it offers a unique look from the traditional wooden crate, guaranteed to turn heads at your next shindig. 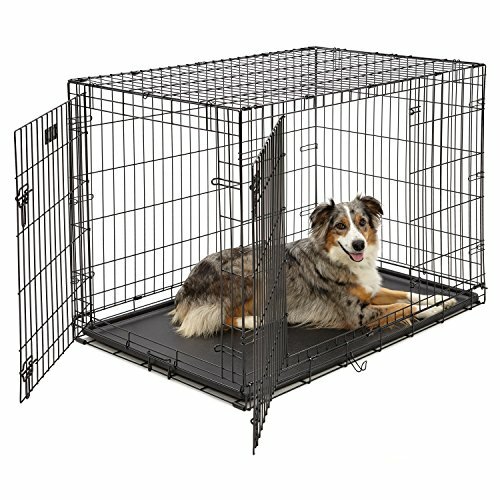 Perfect for dogs that are crate trained and well-behaved. We do not recommend this crate for puppies, chewers or escape artists. 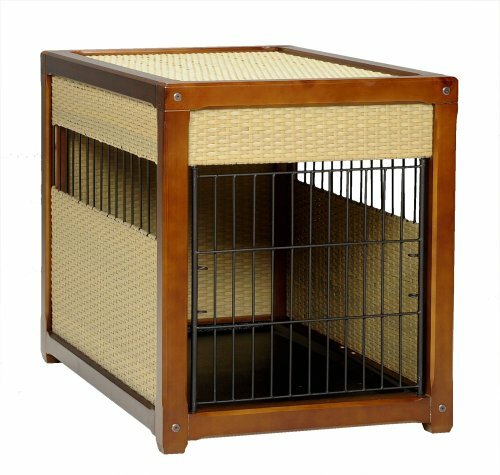 Internet’s Best Wood & Wire Dog Crate with Cushion: A beautiful piece with a classy design, this fashion crate is constructed from wood with smooth metal bar sides. It comes in either a white or dark brown finish to match with any home decor. A double-door entry on the front opens out from the center of the crate, which isn’t the best design if you want something sturdy to hold up against a pushy pup. This is best used to house well-trained dogs that aren’t prone to escaping. Merry Pet 2-in-1 Configurable Pet Crate: This crate not only looks exquisite, but we love the versatility of it. A solid wood top and sides along with strong metal bars on the side render it a solid dog crate, but it can also unfold to become an able gate if you prefer to section off an area of the house for your dog. Then, after all, is said and done, you can place a lamp or some knick-knacks on top to make it the perfect little table. Choosing a crate is no easy feat. If you dive into the world of kennels unprepared, one wrong turn can end up costing you too much money while adding stress not only to your dog’s life but to yours. After taking a thorough look at numerous dog cages, there is one that we feel takes the crown. We chose our top pick based on a few key factors. With that being said, the Midwest Homes For Pets Dog Crate is an excellent all-around choice. It caters to puppies, small, large and even giant dogs, whether you’re looking for crate training or a indoor/outdoor use. The features included are enough to keep it convenient for you, while careful thought went into the steel construction of this wire crate. For the price you pay, the quality is excellent. Corners are rounded to cut down on sharpness, cleaning pans fit snugly underneath the cage and there is plenty of ventilation and space to keep your dog happy as can be.